I have more than one waffle iron and I like to use the different shapes for different things. Granted, none of them are Disney waffle irons, so a Cinderella breakfast is pretty much out of the question, but the shapes do serve their purposes. The thinner waffles have less surface area and tend to be heartier. The waffles made on the Belgian waffle iron have larger pockets and greater surface area, so they are often lighter and crisper. The recipes do play a huge part in the texture of the final waffle, of course, but the waffle iron plays a big enough role that I do stop to consider which will add the most to the final product and take a waffle from “very tasty” to “very very tasty”. I opted for the Belgian-style iron for these Maple Oat Waffles. 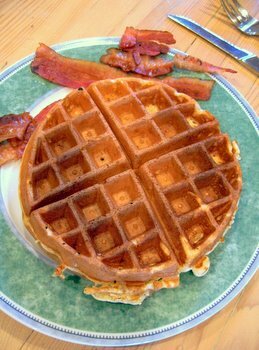 The batter contains a fair amount of butter and gets an extra boost of leavening from beaten egg whites, and I felt that the (relatively) dramatic iron would best showcase the contrast between a light, tender interior and the crisp exterior of the waffle. All this is a very long-winded way of saying that the waffles were excellent. The giant, syrup-catchingÂ Â pockets were a bonus. The recipe also uses oat flour, which imparts a slightly sweet and oat-y flavor to the batter, as well as moisture and tenderness to the interior of the waffle. Oat flour is sold at most health/natural foods markets, like Whole Foods, although it can be made in a pinch by finely grinding up regular oatmeal. I recommend using grade-B maple syrup, as well. It has a stronger flavor than lighter grades and will come through more clearly in the finished waffle. Of course, if you save some to pour (generously) on top, it won’t really matter. In a large bowl, whisk together flour, baking powder, baking soda and salt. Stir in milk, maple syrup and melted butter until just smooth. In a smaller bowl, beat egg whites to soft peaks, then fold into flour mixture, working in two or three additions. When waffle iron is hot, pour batter into your iron and cook as directed by the manufacturer until golden. Keep waffles warm in a low oven, or serve immediately with additional maple syrup. Serves 4-6, depending on the size of the waffle iron. Love waffles & order them in restaurants for brunch. I have always wanted a waffle iron yet living alone I feel it is impractical. Your recipe may just change my mind. Those look great! A waffle iron is one thing I’ve not bought myself and didn’t receive when I got married. I think I’m gonna have to get one. I too live alone and find that my Belgian waffle iron is actually one of the most used appliances in my kitchen. 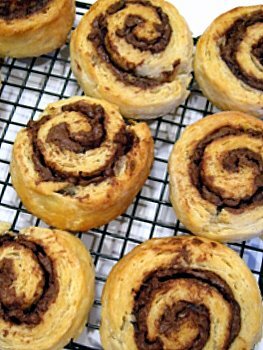 There are so many great sweet and savory recipes to choose from (I’ve used several recpies from this fabulous blog) and remember, they freeze really well, so you can make a bunch of different flavores and freeze them for an easy breakfast/lunch/dinner/snack! It’s definitely a worthwile investment.